Now is the perfect time to get your hands on Idol Hands! The implementation of WASD and arrow keys for moving forward, backward, left and right. You will also still be able to use the left mouse button to drag the landscape if you desire. The ability to zoom the camera in/out using the mouse wheel or the -/= keys. The ability to press the right mouse button to rotate camera but now with the added ability to use the more traditional conventions of moving the mouse left/right. The ability to skip the initial start-up videos by pressing any key. The ability to skip each of the four tutorials using a Skip button. You'd be forgiven for thinking that we truly have godly powers as we've been working the land, night and day, to deliver you another bounty of new updates for Idol Hands! - Health bars on buildings - bash away furlings! 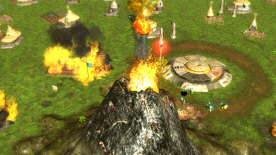 - Ability to disable the spinning effect for earthquakes, meteors, and volcanoes - see all the action straight up. - Ability to disable the jumping to enemy attacks using earthquakes, meteors, and volcanoes. - Ability to skip Old One speech using a key - our Furling OAP supportline is going to be quiet. - Ability to increase game speed temporarily, so you can speed up game play - MORE power to YOU! - Ability to move around overhead map using same controls as main map - WASD, LMB dragging, RMB rotating.